Meet the car that's leading the way in changing the view Americans have of subcompacts. Of course, rising gas prices have something to do with this change of heart, but the Honda Fit is an excellent little car that proves that "small" doesn't have to equal "chintzy penalty box." When the Fit was introduced last year, dealers struggled to keep the car in stock as demand consistently remained high for this versatile, sporty four-door hatchback. The same will likely hold true for this year, so don't expect to get a significant discount. 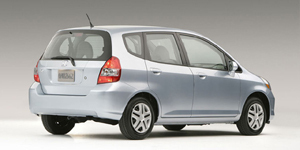 But rest assured, the 2008 Honda Fit's popularity is well earned.